In all modern kitchens uk designers will incorporate a stylish and practical splashback into the overall design. 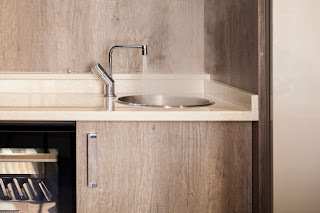 Deciding what sort of splashback to use is a vital decision, not just for decorative purposes but more importantly to protect the areas behind sinks and hobs from moisture, grease and food debris. Without a suitable splashback these areas will soon begin to look tired and worn. Paint will peel, fade and stain, destroying the look of your new kitchen. Choosing a splashback is an exciting aspect of contemporary kitchen design, with many new and imaginative products on the market it is an area that can really make an impact and show individual flair and creativity. So what are the options available and the pro’s and con’s associated with each choice? Tiles - Tiles can be an affordable and practical splashback solution and are widely used in modern fitted kitchens. Available in a vast range of colours, shapes, textures and designs they can make a real impact without costing a fortune. They are also fairly easy to install. Mosaic tiles are also a very effective way to make a feature of your splashbacks. However as hygiene is an important element in any kitchen it is worth mentioning that a tiled splashback can be difficult to keep clean. They can of course be wiped down easily with a damp cloth but bacteria will get trapped in the grout and some staining may occur. Poor quality tiles are also likely to crack over time so it is worth keeping a few spares so they can be replaced if necessary. Glass - For those with a more generous budget, perhaps in the market for bespoke fitted kitchens, such as those on sale at Mascari, glass splashbacks are the height of popularity right now. They are incredibly versatile, a plain glass splashback can be installed directly over a painted surface or you could opt for coloured or textured glass for a different look. Another popular option is to apply the splashback over patterned wallpaper, this can a be beautifully effective way to add a personal touch to your kitchen. Glass splashbacks are very hygienic and easy to keep clean. However they are expensive and they need to be made to measure and cut to size for the perfect fit. Stainless steel - In a professional kitchen uk installers will commonly choose stainless steel splashbacks. They are hygienic, easy to clean and can be moulded as an extension to the work surface. Stainless steel works just as well in the home although it is not seen very often, probably because it needs buffering frequently to limit the appearance of smudges, water marks and fingerprints. Worktop upstands - These are quite simply a continuation of the material used for your worktop. This could be a laminate, solid wood or granite. They are perhaps the easy option, they will always match and look good. The kitchen is usually the most expensive room in your house to renovate so it is important to get it right and stick to your budget. Splashbacks do serve a purpose and will lengthen the life of your kitchen's appearance so spending a bit more is worth while in the long run. For this reason splashbacks play a key role in contemporary kitchen design. This guide has been created to help you make an informed decision on the best option for your requirements.